55 B.C. to 144 A.D.
Caesar's Invasion of Britain : 55 to 54 B.C. Rome's initial campaign in Britain occurred during the Roman Conquest of Gaul under Caesar. By 55 BC he had subdued much of Gaul, with many Gallic chiefs submitting to him willingly. This gave Caesar the opportunity to plan an expedition to the Island, which no Roman army had yet done. His first campaign was relatively small, on the assumption that the Britons, like many other tribes, would immediately capitulate. His landing was however, opposed, and worse, his ships were not suitable for the terrain. Nevertheless, his troops effected a landing, and demanded submission, tribute and hostages. He was not in a position to effect these demands by force however, and was compelled by weather to return to Gaul before he achieved true submission. The following year, he raised a far larger force. Instead of opposing his landing, the Britons, now united under a single chieftain retreated inland. Caesar pursued and defeated the Britons in several battles, and finally agreed to acceptable terms of surrender. Hostages were provided, and tribute was collected, but the Romans again left the island unoccupied. Soon after this a major rebellion in Gaul broke out that demanded Caesar's full attention. Britain remained nominally a tributary of Rome, but was not actually occupied for another 100 years. The Romans under Caesar landed in July B.C. 55 off the coast of Briton with 10,000 men, expecting an easy victory. They were met with a significant, but disorganized resistance, and made a difficult landing under fire. After taking hostages, they withdrew, due largely to bad weather. The Romans under Caesar landed in August B.C. 54 off Britain with 800 ships, 2000 Cavalry, and five legions. 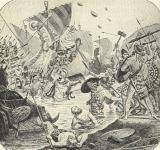 The Briton tribes were now united under Cassivellaunus. Instead of opposing the landing the Britons retreated inland, but Caesar pursued, engaging the united Britons at Thames, and then laying siege to the fortress of Cassivellaunus. After winning all engagements, the Romans took hostages and withdrew. Cassivellaunus † King of the united Britons. Opposed Caesar's second landing in Britain. Roman Conquest of Britain : 43 to 144 A.D.
From the time of Caesar's invasion (55 BC ) to the actual occupation of Britain in 43 AD, the Britons carried on trade with Roman Gaul and continued to pay tribute. There was little to be gained from occupying the region as long as tribes friendly to Rome were predominant. In about 40 AD however, civil conflicts within Britain prompted Claudius to launch an invasion, in support of Roman allies on the island. The tribes that opposed Roman occupation united under Caractacus, and opposed the Romans near the Thames, in the Battle of Medway. The Britons of course, were no match for the Romans and shortly after this desperate battle, Rome claimed to have subdued a large region south of the Thames. A provisional government was set up, and more territory was won over gradually. The final stand of Caractacus was seven years after Medway, and with his capture, the organized resistance to Roman rule collapsed. Ten years after the final defeat of Caractacus, a massive rebellion was launched by Boadicea, a Celtic Queen who along with her daughters, had been badly abused by Roman soldiers. She inspired entire tribes to rebel against Roman rule and her enormous band of marauding Britons sacked several towns and killed thousands of Roman loyalists. Finally Suetonius, the Roman governor met her army of 80,000 in the field and routed them with enormous slaughter. There were no further rebellions in Briton, and under Agricola, the subsequent governor of Britain, positive progress was made toward Romanization. Although the Romans effectively controlled all of Southeast Britain, the Western Mountains of Wales, and the Northern Highlands of Scotland were far more difficult to subdue. Although they defeated the Caledonians (predecessors to the Scots), at the Battle of the Grampians, the native tribes in the region generally engaged in guerrilla style warfare, rather than pitched battles. The Romans found it virtually impossible to subdue the northern regions of the islands, and only with great difficulty brought Wales under control. Eventually, in 122 AD after years of failed attempts to control the marauding bands of Picts and other savages who swept down from the north into Roman territory, Emperor Hadrian order the building of a wall between the River Tyne and Solway Frith. The wall became the northernmost reach of the Roman Empire. Fought A.D. 43, between the Romans under the Emperor Claudius, and the Britons under Caractacus. The Britons were routed, and Camelodunum, Caractacus' capital, taken. Fought A.D. 50, between the Romans under Ostorius, and the Britons under Caratacus. The Britons were strongly entrenched in a high position and showered the Romans with arrows, but the strong armor of the Romans protected them, and the Britons, who could not prevail in hand-to-hand combat, were routed. Caractacus escaped, but was later turned over the Romans in chains, by a Briton Queen who had already submitted. In the year 61 A.D., Suetonius, with 10,000 legionaries, totally routed an enormous host of Britons under Boadicea, Queen of the Iceni, who had sacked Camelodunum, and taken Londinium and Verulamium. The Britons lost 80,000 killed, and Boadicea took poison on the battlefield. Fought A.D. 84, probably on the Moor of Ardoch, between the Romans under Agricola, and the Caledonians, 30,000 strong, under Galgacus. The Caledonians attacked with great bravery, but were beaten by the superiority of the Roman discipline, and retired with a loss of 10,000 men. The Romans also lost heavily. Claudius Fourth emperor. Manipulated by wicked wives, Messalina and Agrippina. Caractacus King of the Britons who resisted the Roman invasion. Convinced Claudius to spare his life. Boadicea † Queen of the Iceni. Led the largest revolt of Celtic Britons against the Romans. Suetonius Roman governor who defeated Boadicea. Agricola Roman general and statesman. Governor of Britain. Pacified Wales.